You're all probably aware of the depression/mental health themed contemporary novels being released this year. Well, this is another. And yet the funny thing is, no matter how many books in the genre you read, it's never any less painful. Each character from each book is completely unique, and going through their experiences with them never gets tiring, and never fails to evict tears from my eyes. The pain never lessens, and the fear never abates. 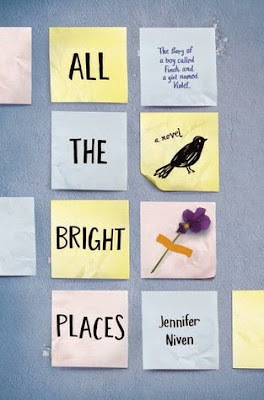 As far as I'm concerned, this genre of Young Adult is one of the most mature and eye opening genres there are, and All The Bright Places is another 2015 release that did not fail to deliver. The book starts right in the thick of things, with both Violet and Finch up on the ledge of their school roof, neither knowing the other is up there, and both contemplating the consequences of choosing death over life. I like that the novel cuts right to the chase and introduces readers to the main characters as they are right at the moment. By jumping right into the plot, readers are enveloped in the pain and fear both characters face right from the beginning. I was invested in Finch and Violet from the first time I saw them, and as the novel progresses, we only get to love them more and more, and sometimes even empathize with them. This book gives what seems an accurate representation of teens who can't find the will to live, and takes a look at mental disorders and mental health from the view of the person facing those problems. It's a real eye-opener, and shows how a person who seems completely put-together and is openly admired on the outside can feel alone and lost within their own minds. Finch's point of view in the story made this abundantly clear; I developed so much love for him, which is why reading about everything that he had to withstand from both himself and society made the book that much harder to get through without bawling. One of my favorite things about this book is that it makes it clear that even though some people have a tendency to look at a person who committed suicide and call them selfish or weak, that's really not the case at all. The book goes through great lengths to show that to the victim - and they really are victims - sometimes suicide seems like the only choice. No matter how many other options there may been in reality, to the mind, there is only one way to go. It's both a shocking and sad reality that most people don't understand, and All The Bright Places puts it in a way that helps us comprehend all of this. Okay, I know I said that was the best part of the book, but the actual best part is that the novel didn't try and beautify suicide and mental disorders. I've read books before that did exactly that - see my review of Sublime - and I despised them with a passion I didn't even know I had. Unlike those books, this one shows two kids' desperate struggles against giving in to that voice that tells them they will never move on; it emphasizes the stark reality of mental health and labels, and through it all, your love for Finch and Violet, both facing very different situations, only grow stronger. The ending of this book provoked so many emotions within me I don't even know what to say. It had me in tears, for reasons both good and bad. Again, the ending only furthers the "realness" of the book, and darn if I wasn't sobbing like a little baby. The hurt this novel serves up is unreal, and for fans of The Fault in Our Stars and The Last Time We Say Goodbye by Cynthia Hand (see review here), this book is a must-read. All The Bright Places is uniquely written novel that I would recommend to all readers of the contemporary genre. Also, there's going to be a movie adaptation of it. While I'm simultaneously excited and freaking out because I don't know how any film can live up to the original, I don't think I'm ready to bawl my eyes out over Finch and Violet all over again. Book Synopsis: Theodore Finch is fascinated by death, and he constantly thinks of ways he might kill himself. But each time, something good, no matter how small, stops him.